This is the best healthy banana bread! It’s bursting with flavor and made with tons of healthy ingredients. This recipe can be made with or without chocolate chips and/or nuts! Looking for more healthy bread recipes? 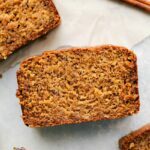 Check out this healthy zucchini bread, this healthy pumpkin bread, or this healthy applesauce bread. While this healthy banana bread does still have refined sugar, it swaps out tons of unhealthy ingredients typically found in banana bread for much healthier wholesome ingredients. The sugar is very minimal compared to most banana bread recipes! 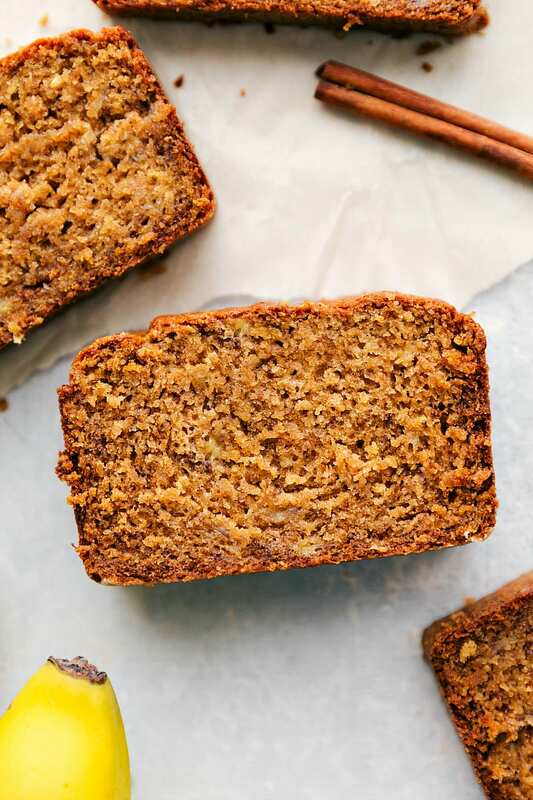 The oats, Greek yogurt, egg, honey, banana (of course), coconut oil, white wheat flour, and cinnamon are all packing this bread with good-for-you ingredients! Oats: Rich in antioxidants and contain powerful soluble fiber. Greek Yogurt: High in protein and packed with probiotics, potassium, and calcium. Coconut Oil: High in healthy saturated fats which can boost fat burning and provide your brain and body with quick energy. Also raises HDL cholesterol (GOOD cholesterol) in your blood which is linked to reduced heart disease risk. Egg: Good source of protein, vitamins, and minerals. Bananas: Loaded with many essential nutrients and help improve your digestive health. Cinnamon: One of the healthiest spices on the planet! Lowers blood sugar levels and reduces heart disease risk factors. White Whole Wheat Flour: A healthy alternative to white flour. Read more here. 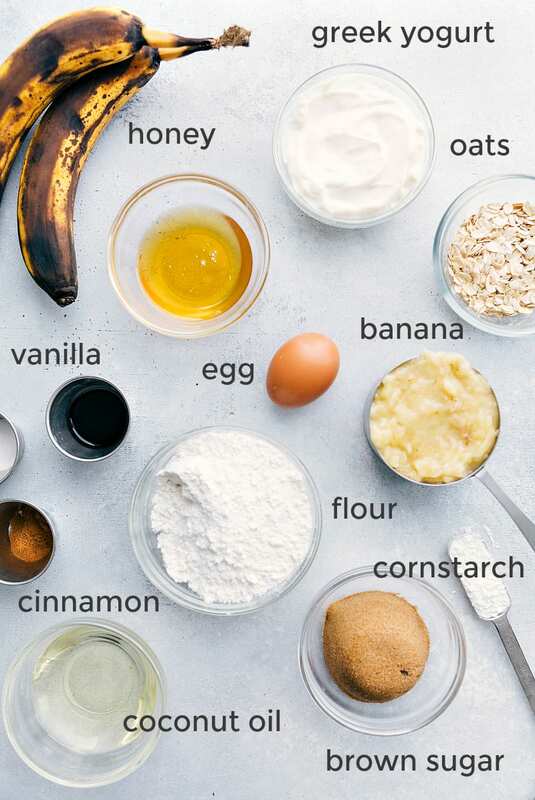 This easy healthy banana bread recipe is pretty straightforward — mix wet ingredients together, mix dry ingredients together, and then combine the two! My top tip for success: use good quality ingredients! I love LouAna’s coconut oil (make sure to measure AFTER it’s melted not before), and Greek Gods honey vanilla yogurt. None of this products are sponsored on this website, but I have found them to make the BEST healthy banana bread! Do not try to use a low fat Greek yogurt or a plain (non-Greek) yogurt in this bread as they won’t yield the same result. The ripeness of your bananas matters!! The riper the banana, the sweeter the bread. 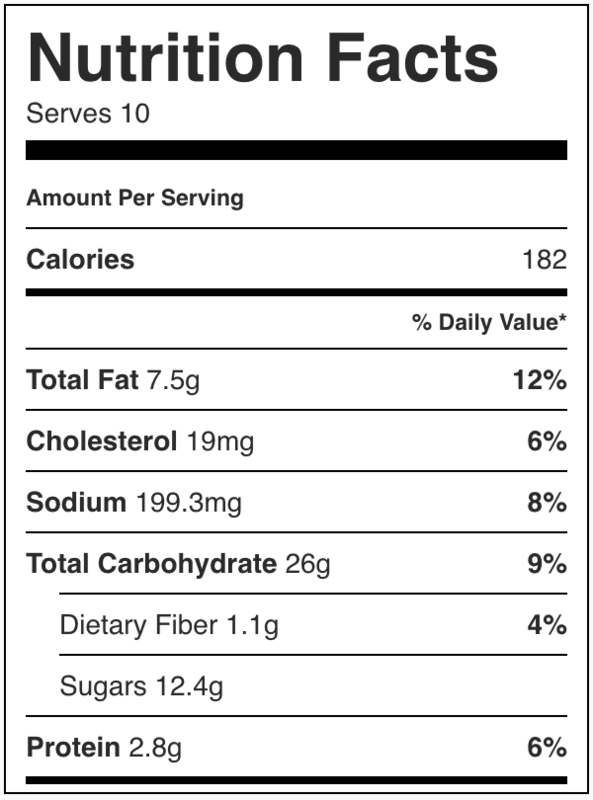 Check out the ingredient picture (2nd photo in post) for the ripeness of bananas I like to use. To add chocolate chips or not: If you want to add dark chocolate chips, you’re still keeping this banana loaf on the healthier side — dark chocolate has healthy fats and plenty of antioxidants! You can also add chopped nuts to make a healthy banana nut bread. Add 1/2 to 3/4 a cup of either and mix them with dry ingredients first to get an even dispersion into the loaf. 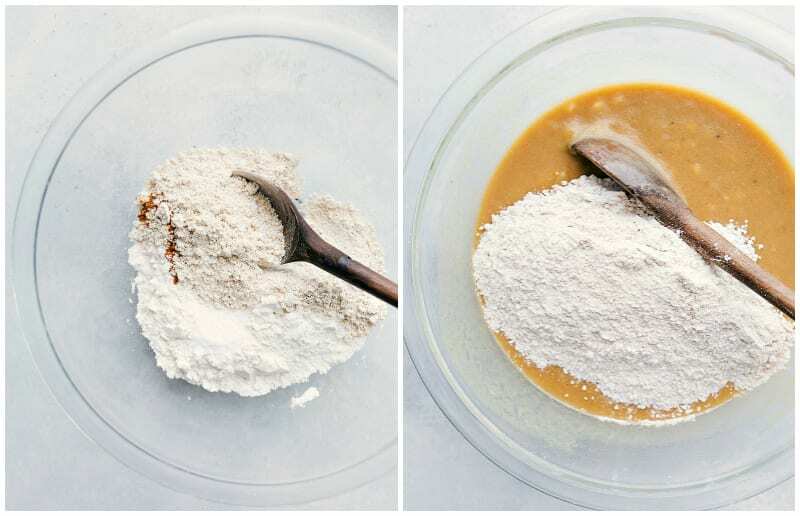 Don’t overmix: if you overmix the batter, you’ll end up with a denser loaf of bread. Mix until ingredients are JUST combined and then pop it in the oven! 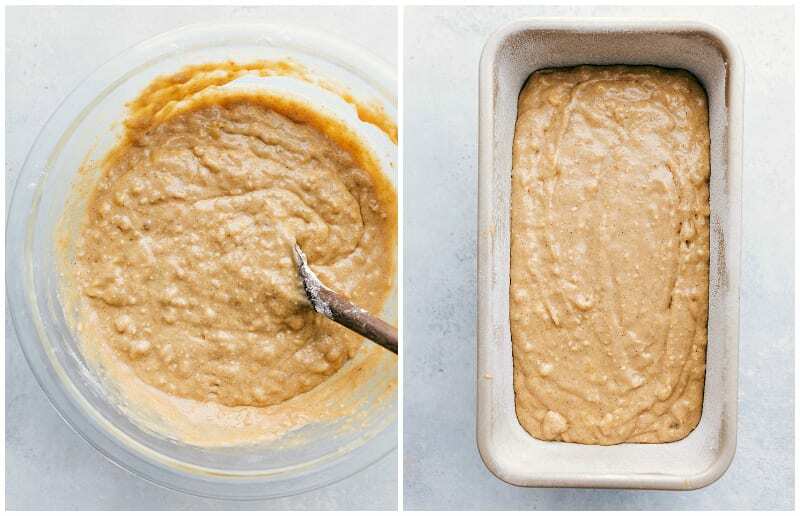 I like to grease the bread pan with nonstick spray AND lightly dust with flour — that way this healthy banana bread comes out like a breeze (let it cool 10 minutes before removing from the pan). 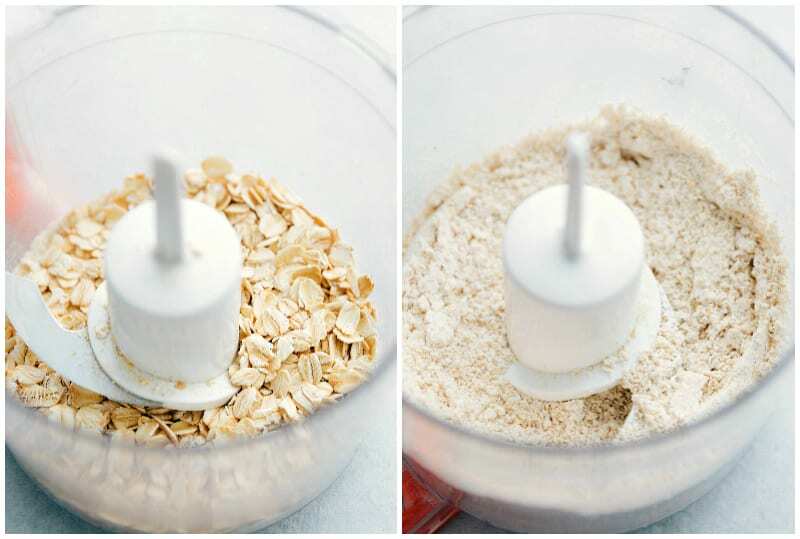 Place the oats (you can use old fashioned OR quick oats) into the bowl of your food processor or small blender jar. Pulse the oats until they are ground into a powder-like consistency that resembles flour. Depending on the speed and power of your food processor or blender, this takes about 60 seconds or less. Make sure to measure your oat flour measurement for this recipe AFTER it’s been turned to flour and not in the whole oat form beforehand. 182 calories per slice. While not super low calorie, remember most of the ingredients are REAL foods that are good for your body. Can I freeze this banana bread? Yes! Freeze the freshest bread you have. If you just baked it, allow the bread to cool completely before freezing to avoid soggy bread or mold. Wrap the bread tightly in plastic wrap and then seal it completely in an airtight container or bag. Freeze the loaf of bread (or even better, individual slices). Bread freezes safely for 3 months. Individual slices of this healthy banana bread defrost in under 10 minutes at room temperature and take slightly longer to defrost in the refrigerator. How long is banana bread good for? 2-3 days at normal room temperature (wrapped tightly/stored in an airtight container). After 3-4 days, this bread is more prone to molding because of the moistness of it and the ingredients used. Do I need to refrigerate this healthy banana bread? After 1 day of the bread being at room temperature, I recommend refrigerating it and warming individual slices in the microwave for 5-10 seconds. While not necessary to refrigerate the bread, it will keep it fresher for longer. This is the best healthy banana bread is bursting with flavor and made with tons of healthy ingredient swaps. This healthy banana bread with yogurt can be made with or without chocolate chips and/or nuts! Preheat the oven to 350 degrees F. Grease and flour a bread pan and set aside. I use an 8 and 1/2 x 4 and 1/2 bread pan. Remove the skins and then mash the bananas with a fork. 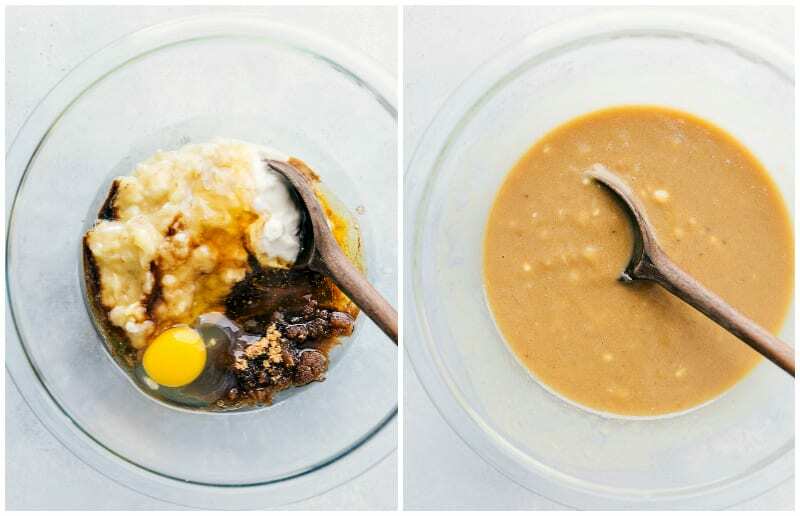 In a large bowl, stir together the mashed bananas, Greek yogurt, egg, vanilla, coconut oil (measure in MELTED form), honey, and brown sugar until well combined. In another bowl, stir together the baking soda, salt, cinnamon, flour and cornstarch mixture, and oat flour (measure oat flour AFTER blending the oats; to make oat flour, put old fashioned or quick oats in a blender and pulse them until they resemble flour). Pour into the prepared bread pan. IF desired, sprinkle 1-2 tablespoons brown sugar on top of the bread for a nice "crust"
Bake for 45-65 minutes or until a fork when inserted into the center comes out clean or the bread starts to pull away from the edges. If needed, tent the top with tin foil if the top of the bread is baking faster than the rest. Store in an airtight container in the fridge. (I microwave a piece for 10-15 seconds before enjoying). Best eaten within 2-3 days otherwise tightly wrap individual pieces and freeze. *If using whole wheat flour the bread does turn out a lot denser. I recommend using only white whole-wheat flour or plain white. Oh my gosh! That is hilarious! And my Hubby would totally make me go get it myself too! lol This bread looks incredible! I wish I had a slice of it right now. Gorgeous pics and videos, Chelsea! Haha SO embarrassing! 🙂 Thank you so much Anna!! It got so so cold by us and I am craving some banana bread! This looks fantastic! I haven’t made any in months … must change that! This healthy banana bread is what my body is actually craving when the days are so cold. This looks very delicious! perfect! Now we can enjoy banana bread without feeling guilty!!! This looks amazing. Oh how I need a slice of this right now Chelsea! Loving this healthier version! Yum! Thanks for sharing. 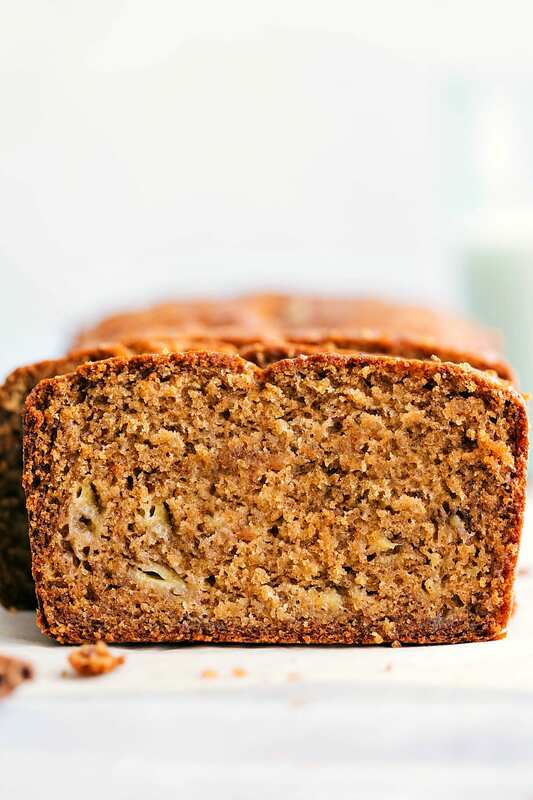 This banana bread looks so moist- love the Greek yogurt! PInning! Haha so fun! My kids would have a blast if we did a family egg drop 🙂 Love that you made a healthier banana bread! It looks so moist and delicious! Haha our 2 year old was so excited about it all! 🙂 Thank you Kelly!! Hi! This looks great, I don’t have vanilla flavored greek yogurt, just plain. Does that work too? Plain works too, I just love the flavor the vanilla yogurt adds 🙂 Hope you love this bread! I love your healthier take on all these baked goods. Thank you for experimenting and giving us what works. I want to make this today but I have a question for you. What if I try it without the sugar at all and just increase the amount of bananas? Will it still be moist and sweet? You are so sweet to thank me, I appreciate it! 🙂 I worry if you increase the bananas too much it will be too wet and too moist. You can absolutely reduce the sugar if you are used to extremely healthy baked goods, but I probably wouldn’t increase the bananas much if at all. This is my new go to recipe for banana bread! I just tried it today and it is amazing! I must be weird, but I don’t love an overly sweet banana bread and this bread has just the perfect amount of sweetness. Thank you!! YAY! 🙂 That is so great to hear! 🙂 Happy you loved this! Wow, thanks for responding SO quickly! Making the bread now! I made this banana bread last night. I only had coconut flour, so I had to add an extra banana and one more egg, When I put the batter in the loaf pans (I doubled the recipe) it was thick like cookie dough. I wanted to cry! I always under bake because it always continues to cook when i remove from my oven. So, when it came out of the oven, I had to taste a corner. HEAVENLY!!! everyone in this house loves it. It was very moist and flavorful. I could taste the bananas and I was happy! Guess what, the next day it was even more moist and flavorful!!! Thank you, Chelsea, your recipes are always awesome! You are so sweet to say that, I appreciate it so much! I am thrilled you loved this bread and it was so good and flavorful! Thank you for the comment! I made this scrumptious reciepe and it was superb! I only had coconut flour, so I added an extra egg and another banana. When I put it in the oven it was thick like cookie dough. I wanted to cry since I doubled the recipe. It was sooo good, I had to force stop. Thank you for another awesome recipe, Chealsey. ? This recipe is fantastic, definitely will be my go-to recipe for banana bread! The bread came out so moist and light and flavoursome! I added chopped walnuts to the batter. Also I used buckwheat instead of oat flour and wholewheat flour mixed with spelt flour. It is perfect! You know the recipe is good when the uncooked batter is good enough to eat with a spoon. My husband’s favorite banana bread is the one with cinnamon sugar smothered throughout (yum!) and I was about to make it but decided to try to find a recipe I’d feel good about my little girl eating, and came across your recipe! My whole family loved it — and I couldn’t believe my husband enjoyed it! I’m so thrilled to hear your whole family (even your husband!) enjoyed this bread! 🙂 Thanks for the comment Caitlin! Is there a way to use plain greek yogurt?? Ha im poor and don’t want to buy more. Like could I maybe just add more sugar or something? Or is that too risky? Plain will work fine, I just prefer the flavor of vanilla 🙂 I’d just add a teaspoon more of vanilla! Enjoy! I love this recipe. Made my whole house smell good. I am always looking for ways to make food healthier. My husband & 4 boys tore thru this bread and requested more. Excellent recipe. Thank you for sharing. My daughter and I had a wonderful time making this bread this morning! It felt good to teach that healthy alternatives can create just as wonderful a bread, if not better!! It is so moist and flavorful. We did add a few chopped walnuts to the brown sugar crust for crunch and texture. Thanks Chelsea for this and all your delectable recipes!! Could plain regular (not Greek yogurt) work instead of the Greek yogurt or would that just be a runny mess? Thanks in advance!? Unfortunately not; the Greek yogurt is a lot thicker and more substantial! I’m confused by the first ingredient. Is it supposed to be 2/3 cup banana? or 2 to 3 cups banana? And if so, 2-3 cups is a bit vague. The list says bananas, plural… then it says (~1). I’m interested to make it but want to understand the ingredients first! Thanks! Hi Chelsea, have you ever tried making this with a gluten free flour blend instead of white whole wheat flour? I haven’t yet, sorry Lindsey!